By the latest version VeryPDF Document Converter 6.0, you can convert Word to PDF and Specify page size with very detail setting options. Meanwhile, this method can be applied to convert all the printable file to PDF and then specify page size. In the Document Converter 6.0, Batch PDF Editor Tool has been added, which can be used to edit PDF basic information, change PDF page size, stamp PDF, set password and so on so forth. However, even if the functions have been enhanced but the price this software is still the same and if you are older user of Document Converter, we really would like to update for you. In the following part, I will show you how to use this software. There are two similar software stated on our website: Document Printer and Document Converter. Please download Document Converter then you can fulfill functions I stated here. Once downloading finishes, please install this software by double click the exe file and following installation message. When installation finishes, there will be an icon on the desktop. Please click it then the conversion will be launched at once. Please launch this software then you will see the following snapshot. Please click button Add File then you can add Word document to software interface. Or you can drag files from its containing folder to software interface. If you need to do the setting part, please click button Setting where you can choose conversion mode, set some basic information, set password to protect PDF file and so on. When you finish setting part, please click button Start to run the conversion. A few seconds later, there will be converted PDF file showing up in output folder. Please click File option then choose Run Batch PDF Editor Tools in the dropdown list. 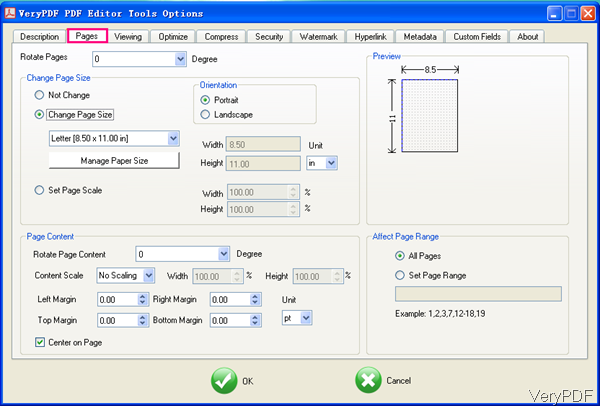 Then you will enter PDF Editor Tool software interface. Please add output PDF file to software interface by the same way and specify output folder. Click button Option then you will enter the following menu tab options. Here you can set PDF page margins in four directions, choose PDF page orientation, rotate PDF page and content, and choose the page range applied in the PDF file. When you finish setting part, please click button OK to back to the main interface. Then click button Start on PDF Editor Tool then the processing will be launched at once. By this method, you can run the conversion from Word to PDF and specify page range easily. During the using, if you have any question, please contact us as soon as possible. How to convert documents of MS PowerPoint to bitmap image? This entry was posted in docPrint Pro and tagged word to pdf. Bookmark the permalink.